Paint serves two purposes: it protects and decorates. The advantage of paint over other types of surface coating such as nickel or chrome is that paint can be applied to any kind of surface, including wood, metal, stone and synthetic materials. Paints are either solvent- or water-based and contain pigments, fillers and other additives. To achieve optimal long-lasting protection and a flawless paint coat, it is important to prepare the surface properly. There are two basic methods of preparation: a mechanical and a chemical procedure. The purpose of the preparation is to clear the surface of dust, oil, fat and moisture. Metal surfaces should always be treated with rust protection before they are painted. So-called wash primers or anti-rust paint is ideal for this purpose. 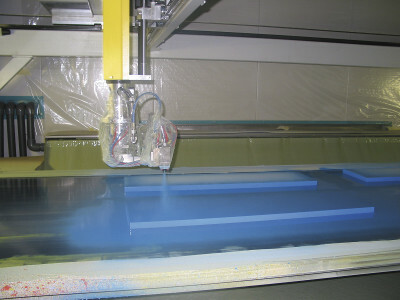 One-component paints are in a liquid state during processing and harden when exposed to air. Two-component paints are also liquid, but in contrast to conventional paints they harden due to a chemical reaction with the hardener. The process by which the paint state changes is depicted in the illustration shown here. A paint contains several substances that are dissolved in a solvent or water. After drying, during which the solvent volatilizes, the once solid substances return to their former consistency. Viscosity is a measure of a fluid's resistance to flow. Thick paints are called high viscosity paints while thin paints have a low viscosity. Viscosity is measured by recording the time it takes for a certain quantity of paint to flow through a viscosity cup. This procedure is not suitable for thixotropic materials, which are measured using rotational viscometers. The paint consistency should be matched to the type of application. Temperature also plays an important role. Basically, paints are thinner when warmer. This can lead to considerable quality impairments if temperatures fluctuate. A rise or fall in the temperature can strongly influence viscosity. This in turn will increase or decrease spray gun performance, which will result in a film that is either too thick or too thin. The consequences are often poor coating results and long drying times. Airless - atomization is accomplished by directing fluid under high pressure through a controlled orifice. Airless works best when used to quickly apply high volumes of coatings to large surfaces, such as bridges, storage tanks, or large sheets of metal. Airless is most often used to apply protective, rather than decorative coatings. Typical fluid pressures are up to 5000 psi at the gun. Air-Assisted - atomization is a hybrid application method that combines the hydraulic atomization method of airless with the atomization of aircoat / air spray. The result is an atomization level between air spray and airless. This process is ideal for many finishing and coating applications that require high production levels and a relatively smooth finish, such as wood furniture topcoats, fabricated metal parts, and farm and construction equipment. Air-assisted atomization typically utilizes air pressures up to 35 psi and fluid pressures range from 250 to 4000 psi at the gun. Air-Assisted Electrostatic - Electrostatic technology can be applied to air spray , air-assisted and airless spray methods. Electrostatic applicators greatly reduce over-spray while providing better film coverage than non-electrostatic applicators. Electrostatics are commonly used in automobile, aircraft, heavy equipment manufacturing and metal finishing. Kirkco offers both air spray and air-assisted/airless electrostatic spraying equipment. Material: This is an airless atomization paint spraying process. An electric, pneumatic or gasoline engine powered pump feeds the spray medium from the intake to the nozzle. The pump puts the liquid medium under pressure and pushes a relatively large amount of material through a small nozzle opening. The dynamic pressure of the material can be regulated to up to 530 bar. The nozzles are of tungsten carbide and contain bores of 0.13 - 1.3 mm. An airless system consists of a pump, hose, filter, gun and nozzle. The material delivery rate and jet width are determined by the shape of the nozzle. 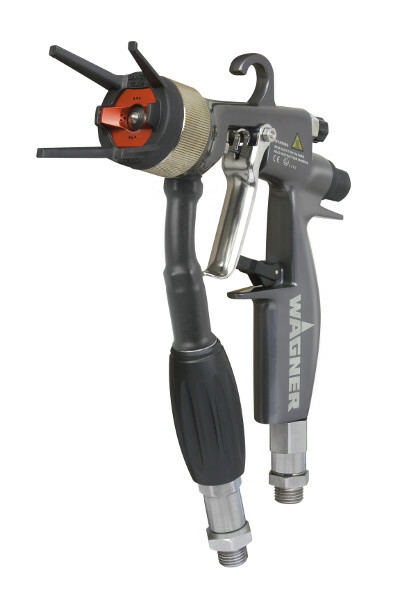 Air: In this process, the atomization air flows out of a ring-shaped opening formed by a bore in the atomizer head (air cap) and the paint nozzle positioned centrically within it. The spray jet shape is controlled by shaping air (horn air) bores. The air emerging from these bores converts a spray jet with a nearly circular cross section that is vertical to the jet axis into a jet with an elliptical cross section. The atomizer air pressure is generated by compressors. Rotary: The paint to be atomized is directed into the rotating bell through small bores and valves. This material can be fed into the bell either centrically or acentrically. The bells are powered by pneumatic turbines. Via the interior surface of the bell, the paint film reaches the edge of the rotating bell and is mechanically atomized on the basis of aerodynamic and centrifugal forces. The paint droplets that fly off of the bell move radially away from the bell and therefore would never reach the workpiece located in front of the atomizer along the same axis. This is where shaping air comes in. It emerges from a ring behind the atomizer bell and guides the droplets toward the workpiece.